Just as the U.S. Coast Guard motto of Honor, Respect, and Devotion to Duty guides its mission to defend and preserve the United States of America, so does Haskell apply its values and commitment to homeland security. 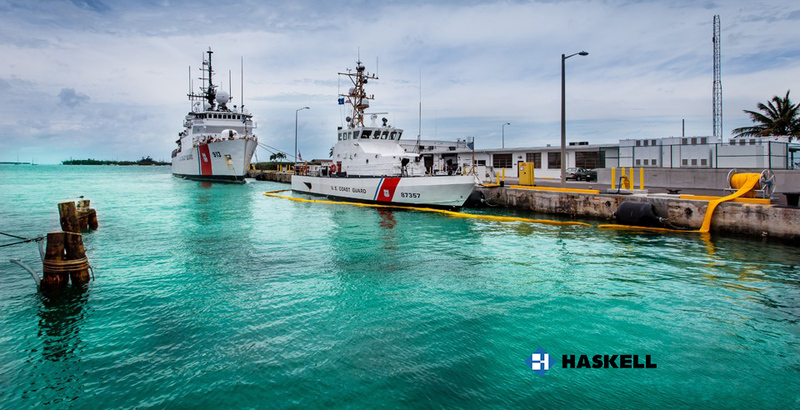 For more than 10 projects for the USCG in recent years, stretching from coast to coast, Haskell has earned its stripes in the support of a variety of projects. These range from design and construction of new facilities to additions and renovations for waterfront work, upgrades of electrical, water, sewer, data/communications and air systems, maintenance operations, dredging, storage buildings, equipment shelters, and even facilities that house training simulators. Several facilities and projects have been critical to the preparation and accommodation of newly commissioned Fast Response Cutter and the Medium Endurance Cutter vessels, while other projects have assisted the USCG in relocating operations. Whether it is assisting the Coast Guard in recovery after natural disasters such as Hurricane Sandy or fire destruction, or delivering much needed improvements to existing facilities, Haskell has demonstrated sensitivity to “green” design, environmental concerns and to assuring day-to-day operations are not adversely impacted during project execution. Homeland security is now and has been a high priority at Haskell and Benham. Go to Haskell's web site to further explore our parent company’s expertise.